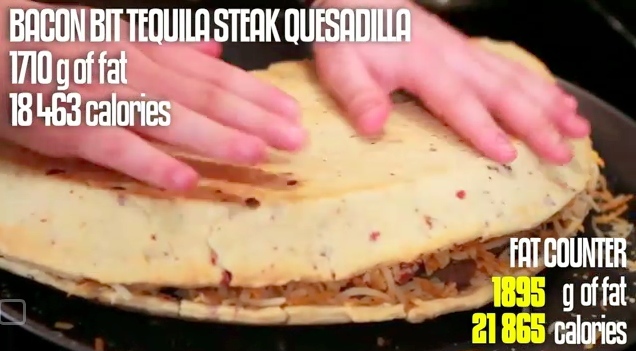 Epic Meal Time: Tequila Taco Night « Gluttoner: You gonna eat that? The gentlemen from Epic Meal Time are back and it’s taco night. Not just regular taco night: tequila taco night. Patron Gold tequila, Patron Gold salsa, Patron marinated ground beef, Patron marinated chicken, Patron steak, Patron marinated bacon, refried beans, lard, bacon bits. It’s a bacon bit steak quesadilla in a bacon bit and lard tortilla wrap. It’s a 10,000 calorie “el gigante” burrito. It’s nachos with tequila guacamole and crispy bacon instead of chips. It’s 13,000 calorie bacon weave tacos. It’s over 9000 grams of fat and 98,000 calories in one meal. Yep, it’s another epic meal.